He said that the revenge policy of the government was such that a judge and and a former Chief Justice were going to be hauled before the courts just because they had expressed a certain opinion. “This is a very dangerous trend. A judge must have the right and the freedom to deliver a ruling. This applies to the Attorney General’s Department as well. At this rate, even the present Attorney General could be accused of expressing his view on the duration of President’s term” he argued. Appointing Ranil as law and order minister is a joke. Now all crooks will go free. Certainly bond crooks will walk free as Ranil is part of them. Lasantha murder investigation that is in its concluding stages will be hijacked again. Ultimately the nation suffers as it is straddled with felons and fugitives on all sides. President Maithripala Sirisena and Prime Minister Ranil Wickremesinghe yesterday effected the first round of Cabinet changes confined to portfolios of the coalition’s main partner, the United National Party (UNP), which evoked mixed reactions. The much-anticipated swearing in of the Cabinet took place last afternoon but it was devoid of a full reshuffle as President Sirisena said more changes were in the offing in two weeks. What transpired was a UNP reshuffle and the nation will have to wait longer to see the full new-look Cabinet. Expressing his views at the closed-door event, the President said that in the future, subject areas of some ministries will be changed and will come under the purview of more appropriate institutions. He also said that the Cabinet reshuffle of UPFA ministers will be done within the next two weeks and added that necessary changes would to be made at State institutions and corporations in the future to enhance efficiency. President Sirisena said that the future plans of the Government would be successfully implement for the betterment of the public while making the necessary alterations and rectifications and taking into consideration the message the people gave the Government. The much-anticipated change in the portfolio of the Law and Order Ministry did not materialise as Premier Wickremesinghe was handed its reins, replacing Sagala Ratnayaka. Speculation was rife that the UNP was keen to have Field Marshal Sarath Fonseka as the preferred successor but it is learnt that under Sri Lanka Freedom Party pressure President Sirisena declined. The result was the Premier being handed over the responsibility although Wickremesinghe was heard subsequently saying that the move was temporary. UNP veteran Lakshman Kiriella was assigned the Minister of Public Enterprises and Kandy Development with the former portfolio held by party’s General Secretary Kabir Hashim. He eventually was made Minister of Higher Education and Highways, a portfolio held by Kiriella. Ratnayaka was appointed Minister of Youth Affairs and Southern Development with the 69-year-old Piyasena Gamage named State Minister of Youth Affairs. The young Harin Fernando was appointed Minister of Digital Infrastructure and Foreign Employment but sans the subject of telecommunication. However, Fernando has been vocal that the telecom title is irrelevant with both the key subjects of Sri Lanka Telecom and Mobitel being private companies and hence this meant there was little say in the affairs of both entities. Among the surprises was the appointment of Ravindra Samaraweera as the Minister of Wildlife and Sustainable Development. Among the state ministers were Gamage (State Minister of Youth Affairs and Southern Development), and Ajith P. Perera who was named State Minister of Prison Reforms and Rehabilitation. The vocal Harsha de Silva got an upgrade as the State Minister of National Policies and Economic Affairs, a subject he oversaw previously although as a Deputy Minister. Sources said that Dr. de Silva was to be made a Minister but President Sirisena had other ideas. J.C. Alawathuwala was appointed the Deputy Minister of Home Affairs. Political analysts were disappointed firstly with the changes within the UNP as well as the fact that the rest of the Cabinet saw no changes except to wait longer. “It was more of a reshuffle within with the usual names rather than anything new,” said one analyst. Some of the UNPers were more frustrated that there were no significant changes with State Foreign Minister Vasantha Senanayake expressing his disappointment whilst a few others towed the party line by being diplomatic. Reuters in its report said the governing coalition of the Sri Lanka Freedom Party (SLFP) and the United National Party (UNP) blamed the defeats at least partly on its lack of progress in several anti-corruption investigations. President Sirisena, the leader of the SLFP, and Prime Minister Wickremesinghe won office by promising to investigate corruption under the previous government led by Mahinda Rajapaksa. But critics charge the investigations slowed under previous law and order minister Ratnayaka. The corruption investigations have focused on family members of Rajapaksa, now a legislator on the opposition benches. They face allegations ranging from the misappropriation of state properties to unexplainable assets. Two of Rajapaksa’s sons, Namal and Yoshitha, have been arrested and released on bail over money-laundering allegations. One of his brothers, Basil, who headed the economic development ministry, has also been arrested at least three times, twice over suspicion of misuse of anti-poverty funds and once over suspicion of laundering money. He is free on bail. 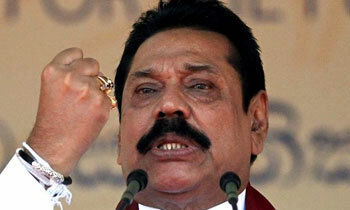 All the Rajapaksas deny wrongdoing. The Government has yet to fulfill the promises it campaigned on. Those include a new constitution aimed at devolving some powers to provincial governments dominated by ethnic minorities, facilitating an international probe into alleged war crimes in the final phase of Sri Lanka’s war against the Liberation Tigers of Tamil Eelam and fiscal discipline efforts sought by the International Monetary Fund.